I’ve always loved decorating for Valentine’s Day – even as a child I remember setting out pink and purple accents in my room! Over the years I’ve moved away from the pink and purple, but I still enjoy working in a few bits of Valentine’s Day love into my decor. This year I really tried to keep it neutral so that the pieces blended in with my current winter look. This little display is full of my decorating essentials! Have you decorated for Valentines Day? Are you going all pink and purple, or are you feeling a more neutral vibe this year? It looks so good! Love the garland!! I have a plain craft paper pennant one from Target that I could jazz up for Valentine’s Day. Thanks for the inspiration! 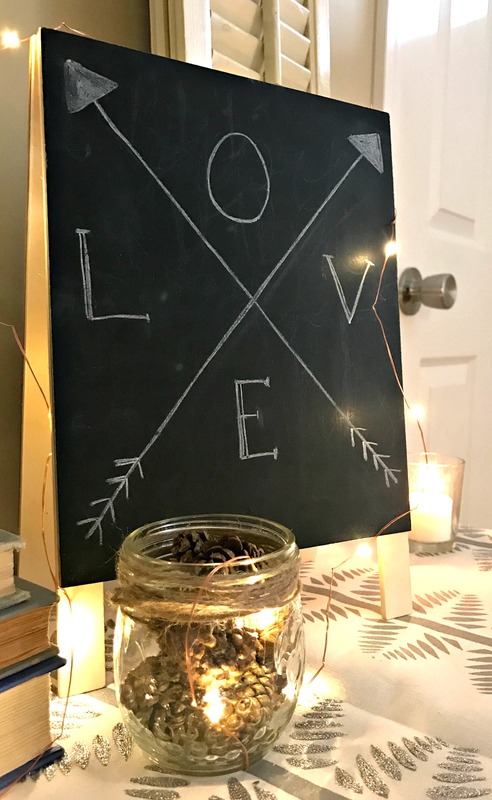 And I don’t know why I didn’t think of a cute chalkboard design…. We still have some pink and red for our decor because Elizabeth couldn’t live otherwise 🙂 HAHA! Thank you! 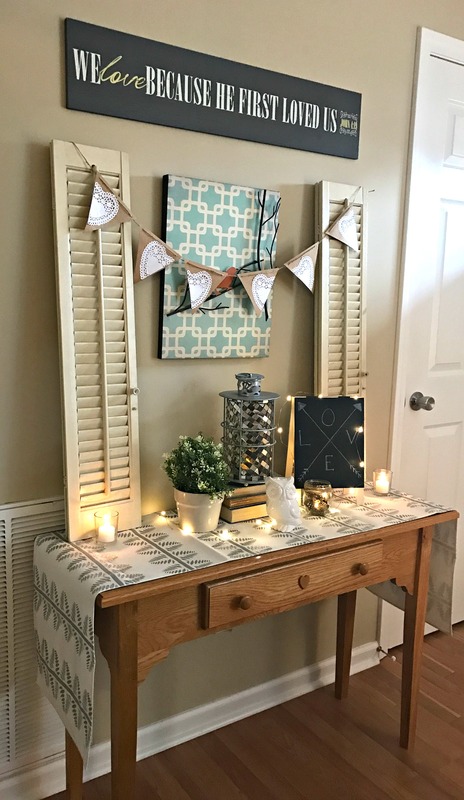 I love Target’s garland banners…I currently have three on display in my house! Looks lovely! I added some gold into my reds and pinks this year and love it. It’s fun to change things up a bit. Your twinkle lights looks so cozy. My cats always hover around those lights. What do yours think of them? You know, my cats don’t seem to notice the twinkle lights. They are on two pieces of furniture that the cats *usually* don’t get on, so maybe that’s why they don’t care. This is so subtle and pretty! I love your shutters, too! Thank you! I have enjoyed those shutters for so many years now, I don’t think I could decorate without them! Your decor looks really elegant! Love it! Of course I’ve added reds since it flows into the rest of the house. I can’t resist those red hearts for Valentine’s! I found an adorable decor at the Dollar Tree of all places. It’s hanging from my old window in the foyer along with a wooden heart. That’s all I’ve done so far, but there’s always tomorrow! 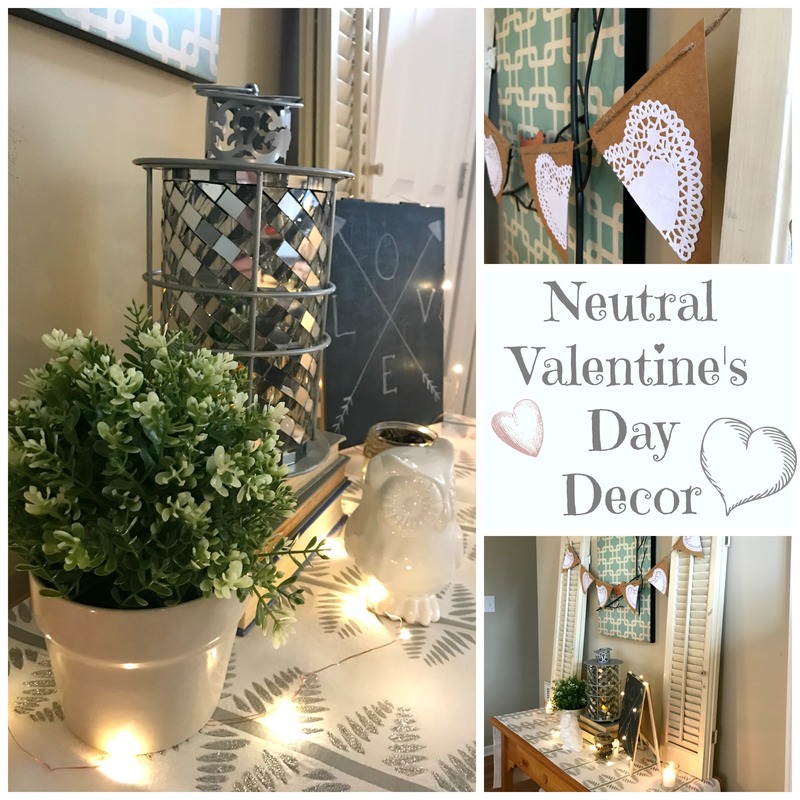 I love the idea of a neutral theme for Valentine’s Day! I like having a bit of pink and red throughout the house for a bit. I’ll replace it at the end of the month with some green and gold for St. Patrick’s Day! Valentine’s Day is definitely a fun one with kids! My mom always made it really festive for us. Pink and Red at my house Whitney!! I love a pop of color in the dead of Winter and since RED is my favorite color I enjoy spreading it through the house. This is SO pretty Whitney. I love this neutral inspiration. Can’t wait to make some Valentine boards over here! Oooh I can’t wait to see your Valentine’s Day chalkboards!! I love how simple it is. Very elegant and soft touches of decor. Lovely!